Tonight begins the celebration of Chanukah. And, thanks to a freak occurrence with the Jewish and secular calendars, tomorrow Chanukah and Thanksgiving will collide and merge into Thanksgivukkah. The next time this will happen will be in the year 79811. So tomorrow we’re going to enjoy spinning the dreidel as we eat cranberry sauce and we’ll have some latkes with our turkey. 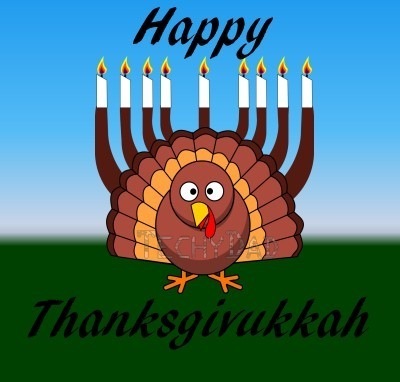 NOTE: I created my "Thanksgivukkah" image using "Turkey" by Pippi2011 and "Simple Menorah for Hanukkah" by semjaza. Both are available via OpenClipArt.org.